I managed to arrange a business meeting near Cambridge to be held yesterday, so that I would have a good excuse to stay on in the evening and attend the first ever Cambridge Geek Night event at the Maypole Pub. Arranged by @vero, the event was very well attended with standing room only by the end. 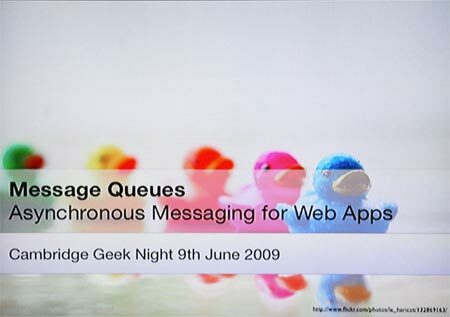 I enjoyed @garethr‘s talk on Asynchronous Messaging for Web Apps, it was a great intro taster to the subject. You can view his slides here. Then we had a lightning talk from @martinkl about his new browser testing software Go Test It, and a lady called Helen from @HoldsworthPR on a startups conference being held soon. There was also plenty of opportunity to socialise and have a few beers (shame I was driving). Good to see so many locals in attendance as well as a few of us from further afield. I shall keep my eye out for the next one. Stay informed by reading the Cambridge Geek Nights blog, and come along next time if you are in the area! You can also follow the tweets here. This entry was posted in geek dinners, geekery, social and tagged cambridge, camgeeknight, gareth roger, geeks, martin kleppmann, social. Bookmark the permalink. Minions 52 – Quick! Call A Doctor! © 2006-2019 Caroline Mockett, All Rights Reserved.